San Luis is located in the rural area of Puerto Asís, Putumayo, Colombia. Around 70 percent of its population is African descendant that around 40 years ago arrived from the towns of Tumaco, Barbacoa and Cumbitara in Nariño. This community is organized around the “Afrosanluis”, a community council chaired by Ana Milena Ortiz. She is a young mother and an excellent leader who knows more than anyone what are the problems that the inhabitants of San Luis face and works hard to find solutions. Improving their quality of life is, in fact, her main goal. According to Ana Milena, until 2009, at least 90 families lived in the village but throughout the years some of them went away, escaping from violence and glyphostate sprayings that affected their gardens. Those who are still there today rely on agriculture and fishery for their livelihoods. “We, the Afro communities, always try to settle on the banks of the rivers because it is where we have access to water and fish which is our main food” says Ana Milena. But this is not always an advantage; to live on the side of a river means to be at risk of floods like the one that occurred on 20 July 2010, when Acaé River overflowed taking away the school along with some houses, destroying the Health Center and destroying all the crops. After the flooding, the community was terribly affected mostly because of the destruction of the crops causing the loss of people’s livelihoods. Water stagnation brought diseases and with no Health Center there wasn’t a way to treat them. Moreover, with no school, children weren’t able to keep studying. In response, FAO and OPS, financed by the Central Emergency Response Fund (CERF), agreed to work on the recovery of the community. Technicians of both organizations and of Pastoral Social, worked along with the people of San Luis. Together they recovered the Health Center and installed a safe water system in both the Health Center and the school’s cafeteria. They also built a community garden to teach people how to recover their own gardens. Homemade water filters where installed in every house to ensure clean water for everyone. “We, the farmers, acknowledged that our soil had nutrients and that we could plant on it. We just needed to be willing to work on the gardens and be responsible” Said Ana Milena. “We learned to prepare compost. We realize that we had the ingredients to prepare it with no chemicals”. 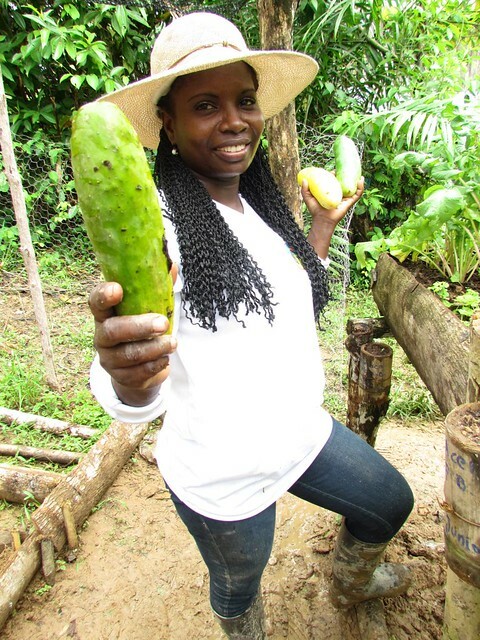 “We already have our food crops; Plantain, yucca, chiro, corn, raise and even vegetables that we thought wouldn’t grow here” added Ortiz just before she decided to invite us to her home garden where she sang some songs about San Luis recovery that she wrote herself. That was her way to say thank you and good bye. “The United Nations, through FAO, and as operative institution, La Pastoral social. La Pastoral Social was here in San Luis with FAO’s support so we are very happy. We are very happy with our home gardens. Each one of the families is deeply happy. Deeply happy and with much initiative we have replicated the community garden work and now we see some nutritive vegetables. With this nutritive vegetables and with some hens that they gave us, now we have good eggs to complete our diets. How good those hen’s eggs are, we cook make the scrambled to give them to our kids.